‘Out of the Inkwell’ starts with live action footage of a black cleaner reading a book on hypnosis. Hypnosis as conceived by the Fleischers is more like a magic spell, and has the power of making things come alive. The cleaner hypnotizes a pen that then draws an old-style Betty. He hypnotizes this miniature Betty, too, but she turns the tables on him, hypnotizing the broom and the fan, and finally, the man himself, making him clean the room rapidly. ‘Out of the Inkwell’ returns to the origins of Max Fleischer’s career, blending animation and live action using a character born out of ink. The result surely is one of the more original latter day Betty Boop cartoons, and a delightful mix of live action, stop motion and traditional animation. The cartoon delivers less than it promises, however, and is particularly hampered by the black man’s extremely stereotyped lazy voice, which sounds like it has been dubbed. Highlight is the hypnotized Betty, who dives and swims in mid air, and who is animated extraordinarily rubbery. 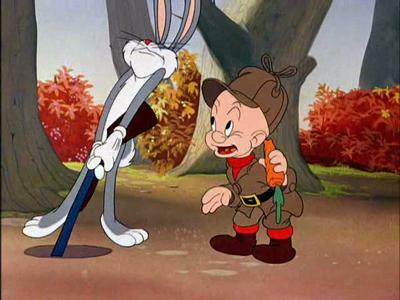 ‘The Hare-Brained Hypnotist’ was only the sixth encounter between Elmer Fudd and Bugs Bunny, and only the second by Friz Freleng, but already the routine was ripe for experiment. In ‘The Hare-Brained Hypnotist’, penned by Michael Maltese, Elmer consults a book on hypnosis to catch Bugs. His hypnosis skill work on a bear, which Elmer makes think it’s a canary. It fails on Bugs however, who in turn manages to hypnotize Elmer, making him think he’s a rabbit. Elmer immediately swaps into a Bugs Bunny routine, leaving Bugs to play the straight guy. But after another hypnosis battle down the rabbit hole, Elmer returns to his former self, fleeing into the distance, while Bugs tells us he’s the B19, referring to the Douglas XB19, a huge experimental bomber plane, which had had its first flight on 27 June 1941. ‘The Hare-Brained Hypnotist’ is not a very funny cartoon. The comedy suffers, because Bugs is forced into the role of the straight guy, a problem the cartoon shares with e.g. ‘Tortoise Beats Hare‘ from 1941. Nevertheless, Elmer’s Bugs Bunnyarisms are quite hilarious, especially in a scene where he makes Bugs eat several carrots at one time.